The final gear box before the car or truck’s wheels and axles is called the differential. Depending on whether the vehicle is a front, rear or all wheel drive. 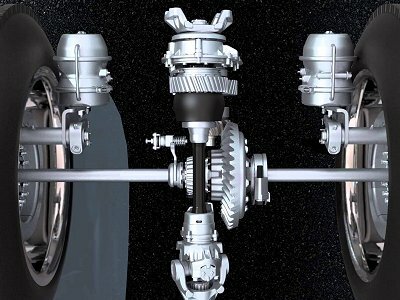 The differential/drivetrain essentially supplies power to the wheels from the transmission or transaxle and regulates the speed of the wheels as the vehicle turns. The gears within the differential are very strong and made of long lasting materials but as vehicles age, those gears can start to wear. Differential fluid is present to lubricate and cool those gears. As with all vehicle fluids, differential fluid becomes contaminated and loses its effectiveness. Dirty differential fluid can lead to poor performance and excess wear and corrosion. Extreme conditions such as towing heavy loads and city traffic can also accelerate wear and tear. Clean fluid helps keep the gears from wearing and also helps regulate the gear temperature. Clean fluid also lubricates the gears making operation smoother. Maintaining your differential can help prevent total gear failure. Maintaining your differential will keep you Road Ready. The drivetrain or powertrain is composed of all the units joined together in a vehicle to make it move. We usually speak in terms of the engine and drive train, so it’s everything from the engine “back” or “out” depending on the car. From the front you have the flywheel on the rear of the engine, then clutch, then transmission, then driveshaft, then differential then axles to the wheels. That’s a manual transmission. If you have an automatic, you won’t have a flywheel or clutch. In their place would be a flex plate and torque converter. On front wheel drive cars, they sometimes have a transaxle, which is combination transmission and differential. Out from there are the axles to the wheels. These are sometimes called constant velocity joints.